DECT Solutions offer users a great level of flexibility, but we know large areas can be difficult to cover with wireless or DECT Handsets. Using a multi-cell solution over repeaters, you can offer an improved end user experience by significantly increasing the amount of devices and concurrent calls available within the space covered. Thanks to our white-labelled DECT services we can help you to quote and install your customers’ cordless systems. With our specialist vendor-trained team, you can relax in the knowledge that your quotes include the correct equipment to provide an optimum level of coverage to meet your customers’ requirements. Whether you’re looking for assistance with quoting hardware or installation services to implement a whole new system and the required network infrastructure (including cabling), our team are on hand to help simplify your DECT projects. To organise a DECT survey/installation for one of your projects or to find out more simply call us on 01484 840048 or email contact@provu.co.uk. Pricing is supplied on an application basis and is subject to additional charges. We’ve expanded our White-Labelled DECT Services! We’ve expanded our white-labelled DECT survey and installation service to now include Panasonic, RTX and Snom multi-cell systems, helping you to give even more options to your customers. Having launched our DECT services back in August last year our team has been busy carrying out Gigaset DECT surveys and installations across a variety of locations throughout the UK. With surveys starting from just £150.00* DECT systems need not be a complicated product to quote for. Discuss your requirements with a member of our team today and enhance your offering! *Survey and installation services are quoted on an application basis and are subject to additional charges. RTX have discontinued their 4002 repeater, we have now sold our final remaining unit of this product which has been replaced by the new 4022. The 4022 is very similar to the old 4002, with just a couple of adjustments. – Press OK on the W52H ‘handset’ and then go to settings. Choose “System Settings” and then select “Repeater Mode”. – Plug in the RTX repeater for 1-5 seconds (We count to 3) and then unplug it. – Plug it in again and leave it. The LED indicator on the RTX repeater will then flash slowly (This means the repeater is ready for manual registration). – Press the paging key on the W52P base until the “Handset” LED light on the base starts flashing. – The LED on the RTX repeater will now change to flash faster than it did before. – Dial #*9 on the W52H ‘Handset’, it will stay on this call for the duration of this procedure. The LED on the repeater will be lit solid. – Press a number between 2 and 7. The LED indicator on the repeater will flash a corresponding number of times and then stay solid. – Accept the registration by pressing the * key and end the call on the W52H ‘Handset’. – Connect this repeater to the RTX USB cable, power supply and your PC. – Load the RTX software on the supplied CD. – Select the COM port the USB cable is connected to. – Press the “load” button. – Write down the “RFPI” number from the “Repeater” section. – Disconnect this repeater but do not close the software. 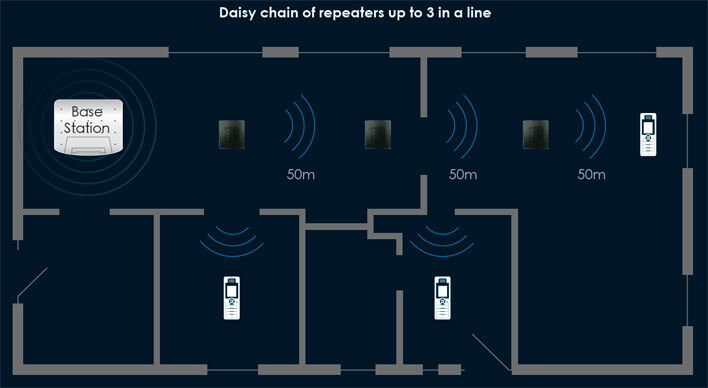 – Connect the next repeater that will be used in the daisy chain. – Type the “RFPI” number you have written down into the “RFPI” box in the “Network Device” section. – Tick the “Ignore Hop Control” box and optionally the “Monitor Beep” if you want that on (useful for testing). – Increment the “RPN” number in the “Repeater” section. This need to go up by one for each repeater in this chain. – If this isn’t the last repeater in the chain, click “Load” and write down the “RFPI” number from the “Repeater” section (This will then be used by the next repeater in the chain in it’s “Network Device” section). – Pair this repeater to the base by following the procedure in steps 2) & 3). * Repeat step 4.1) for each repeater in this chain. * Repeat steps 2) to 4.1) for each chain. 1) Find the IP address of the base unit and enter that in to a web browser to configure the device. 3) Now go to “Servers” (This is where we configure the PBX details and tell the extensions where to register). Enter the relevant information in to the fields and then click save. 4) Next go to “Extensions”, click “add extension” and fill in the relevant information for the extension such as authentication name and password. Don’t forget to choose the server we created otherwise the extension will not register. 5) Next go to “Multi cell” and change “Multi cell system” to “Enabled”, then create a “system chain ID” all the bases that are going to be paired need to have the same ID number. The Synchronization time can be increased/decreased to change how often the bases sync together. Leave “Multi cell debug” set to “None” for general use (only change when you need to debug issues) then click save and reboot. 7) Once the second base has rebooted, on the “Home/Status” page it should come online as Multi cell Unchained(Unchained) Allowed to Join as Secondary. Wait a few minuets and let the bases communicate with each other. 8) On both bases it should now look different under “Multi Cell”. The base with the extension should be listed as the “primary” and the other base/s should be “locked” under “DECT property”. Please note: if your base has been displaying (UnchainedAllowed to Join as Secondary) for a while make sure you have created at least 1 extension on the primary base. Pricing and stock information is available on ProSys, our reseller portal.If you would like to become a ProVu reseller, you can apply via our online reseller application form. Now the RTX Repeater should be reset, power it back on and the light should be blinking slowly. Gigaset have recently released Firmware 42.194 for the N300 and N510 DECT Base Stations. With this release comes a change to the Repeater Mode setting, which is necessary for pairing DECT repeaters. In the handset menu, under System > Settings, the Repeater Mode setting has been replaced by Encryption. This setting relates to the new Gigaset DECT repeaters in the EU which use encryption. These are not available in the UK so you will most likely be using a DECT repeater that does not use encryption. You should therefore turn this setting OFF, to allow you to register the DECT repeater to the base station. If you are still having trouble registering your repeater to the base, please take a look at our handy guide. If you find that when using an RTX4002 DECT repeater (with any device such as Gigaset) and you are hearing beeps on the phone then you will have inadvertently turned on the “verification tone”. The idea of this is so you know when the repeater is being used but the procedure to turn it on is very similar to putting the device into Registration mode so it’s easily done by mistake. – switch it on again. The verification tone will then be turned on or off (depending on whether it was on or off before). Below are some instructions that will help in registering a RTX repeater with Gigaset Base station. 3. Turn on Repeater Mode through the Gigaset handset, go to Settings – System – Repeater Mode. 4. NOW PLUG THE POWER INTO THE RTX 4002 for 5 seconds and turn it off again; then turn it back on. Note: The LED on the RTX 4002 slowly flashes showing that it is now in registration mode. This should be a single flash, if it is a double flash please go back to Step 1 and retry. Note: The LED on the RTX 4002 flashes quickly to show that it is in ‘learn’ mode. Then press the green SEND button. The LED will stop flashing for about 5 seconds; press * again to confirm the pairing. The LED should now show a steady light without flashing. Note: If the LED goes back to flashing quickly then the new settings have not been saved or accepted by the RTX 4002. Repeat item 5. If the LED goes back to flashing quickly again then repeat item 5 with a different X. 7. Now position the RTX 4002 where required, ensuring that it is still within range of the Gigaset Base Station.